Colin Goss Coleridge came to Canada from England on the SS Pomeranian in August 1911 at the age of 22. He joined the Royal North West Mounted Police and served with them in Saskatchewan and Manitoba before being discharged to join the Royal Flying Corps in Toronto on August 13th, 1917. He was awarded a temporary commission with the Corps on December 21st, 1917 and worked as a flying instructor at Fort Worth in Texas and then at Camp Mohawk near Deseronto. While he was in Fort Worth, at Camp Taliaferro, Coleridge was involved in a flying accident on February 9th, 1918, when he was instructing Cadet Cecil Bradford Corbin. Corbin suffered a broken leg and nose in the crash, while Coleridge had broken ribs. Both men suffered burns but Coleridge managed to rescue Corbin from the aircraft and was given an MBE for this action. I was standing about 50 yards from the scene of accident. I saw machine C-226 making a right hand vertical bank just North of the Officers’ Quarters, the undercarriage and right hand Wings struck a tree and then the machine swung nose down to the ground. I saw the engine knocked back to the petrol tank and almost immediately the machine burst into flames. I saw an Officer jump from the rear seat, and owing to the extensive heat I was unable to render any assistance to the passenger I saw in the front seat. Coleridge suffered burns to 90% of his body in the crash and died five hours later in the Camp Rathbun hospital. Coleridge’s parents donated a table to St. Mark’s Anglican Church in Deseronto, with a plaque commemorating their son. The plaque and the table were donated to the National Air Force Museum of Canada in 2018. 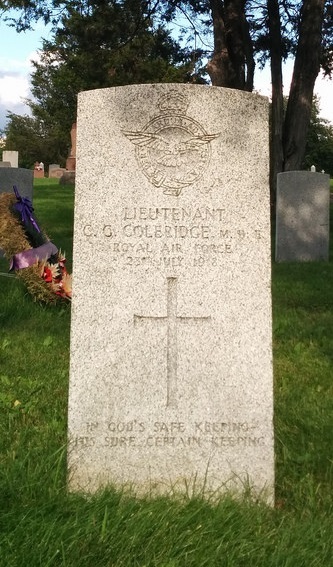 Lt. Colin Goss Coleridge, R.A.F.